What does an athlete do when she is not allowed to take the start of the Olympic finals because of a positive doping test or he is not allowed to compete at the Games for reasons of nationality? He or she brings the case before the ad hoc Division of the Court of Arbitration for Sport, an arbitral body first created on the occasion of the 1996 Games in Atlanta, which is present on site and resolves all disputes within 24 hours. Written by its former President, who teaches and practices international dispute resolution in Geneva, Switzerland, this book tells the story of the ad hoc Division from Atlanta to Sydney over Nagano. It gives an account of the cases resolved, discusses the Arbitration Rules, and explains the practical operation of the Division. It also reviews all the main arbitration law issues which the Division faces, including jurisdiction, arbitrability, due process, the choice and proof of the applicable substantive rules, the remedies against the award, as well as some sports law issues, such as field of play rules or strict liability for doping offenses. 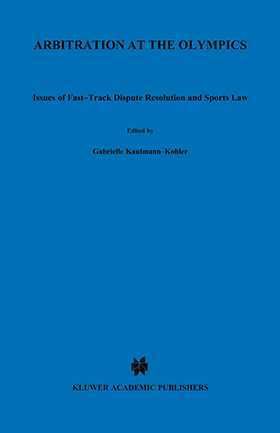 The wealth of information it contains makes this book an indispensable tool for all involved or interested in sports law and dispute resolution. Many of its developments go beyond the sports context and are of general interest to all arbitration practitioners.